Cover: Portrait of Lady Nancy Langhorne Astor by John Singer Sargeant hangs in Cliveden in Buckinghamshire, England. 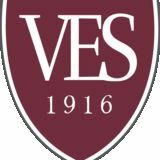 BOARD OF TRUSTEES Virginia Episcopal School, founded in 1916 in Lynchburg, Va., is an independent, coeducational college preparatory boarding and day school for students in grades 9-12. MISSION STATEMENT Virginia Episcopal School is an engaging community that guides students to strive toward full stature in their academic, ethical, spiritual and personal growth. seeking the best fit—a place where they can thrive. The Bishop Jett Society honors VES’ early benefactors as well as the school’s most generous alumni and friends. Donors are listed whose cumulative giving to all funds exceeds $100,000. Mary B. and Chiswell† D. L.
Ruthlee P. and L. Glenn Orr, Jr.
Ellen C. and William A. Rice, Jr.
John C. Hagan ’74 Charles S. Hamel ’56† William King, Jr.
outstanding student experience. Seminal capital projects include renovations to the Harrison Dining Hall and Hight Library in Banks-Gannaway Hall; additional facilities in the Philip L. Van Every Athletic Center; and construction of the William King Center. VES is deeply grateful for the shared vision and generosity of our donors. VES’ annual fund provides unrestricted, discretionary spending for the school’s greatest needs, including faculty salaries, housing and professional development, and student scholarship funding. During the Vision 2016 Campaign more than $10 million has been raised for annual operations. VISION 2016 CAMPAIGN LEADERSHIP Thank you for the leadership, vision and dedication of these individuals. Mr. and Mrs. A. Douglas Dalton, Jr.
Mr. and Mrs. Robert W. Carter, Jr.
Christine P. and Talfourd H.
Mr. and Mrs. William F. Morrisette, Jr.
Mr. and Mrs. Douglas E. Quarles, Jr.
Mr. and Mrs. Roland N. Hill, Jr.
Mr. and Mrs. Edward T. Cook, Jr.
Mr. and Mrs. Joseph P. Durham, Jr.
Mr. and Mrs. Eugene H. Pierce, Jr.
Mr. and Mrs. George P. Ramsey, Jr.
Mr. and Mrs. William A. Rice, Jr.
Dr. and Mrs.† William M. Massie, Sr.
Mr. and Mrs. C. Keith Walden, Sr.
We are able to make changes to the Vision 2016 donor recognition board in the William King Center until December 31, 2016. Assistant Head of School for Advancement. existing endowment funds that match their interests. The stories in the pages that follow are examples of donors who are making lifetime commitments to the endowment funds they have established at VES. 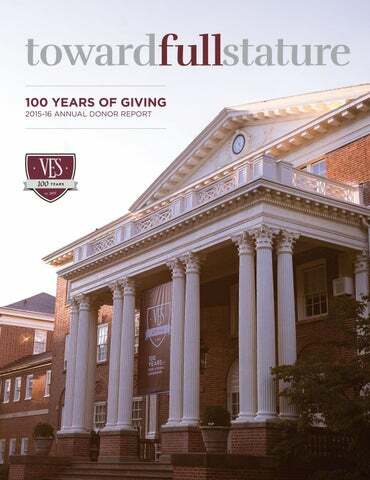 If you wish to learn more about the VES Endowment, inquire about establishing your own endowed fund, or support TOWARD FULL STATURE MAGAZINE | DECEMBER 2016 an exisiting fund, please contact Henry Clarke, Director of Major Gifts: 434.385.3708 | hclarke@ves.org. Donors noted are those who supported these funds in the 2015 - 16 fiscal year. selflessly of their time, energy, knowledge and wisdom. members who make the biggest difference? says Henry Clarke ’03, director of Major Gifts. of aspiring writers, actors and artists,” Emmy said. $700,000/year in annual income for the school. Emmy Ellison ’96, executive director of the Ellison Family Foundation, established VES’ first fully funded teaching endowment in 2016.
leader and dorm parent for 16 years. James W. Hopkins Distinguished Mastership. How would you describe VES today? I am more excited than ever before about VES. The school is re-energized and focused, moving toward an exciting future. We have recommitted ourselves to what Toward Full Stature means and we’re designing and delivering programming that supports our mission across every area, from academics, athletics and arts to student and residential life to expanded leadership opportunities. and create a path for their futures. What do you believe is VES’ greatest asset? faculty, staff and students are what make VES great. Why are gifts like the Hopkins Mastership so How do you see people responding to VES as it kicks off the next 100 years? connected to the promise of Toward Full Stature. committed to creating a wonderful VES experience— and to create and ensure the long-term viability of programs that teach 21st century skills our students need to succeed. Chad with wife, Michelle, and children Abigail, Drew and Phoebe. Sackett White ’02 played on the courst and the football field. recipient Ghaven Williams during his time in school and are proud of his accomplishments. chance to go to VES,” says his father, Bill White ’72. this amazing gift to support my VES experience. what I want to do in life. “It’s also been so nice getting to know the Whites. reason to give, but it does happen for most people. reverberated to touch many people in the VES history. enduring legacy and a life enhanced by generosity can create something that lasts forever. I have chosen to support our alma mater. would produce an after-tax amount of $60,000. $4,000 each year for the school in perpetuity. strategies. For me, the tax benefit is a bonus. was funded from assets in a retirement account. the VES community as a freshman from Amherst, Va.
and is looking forward to VES lacrosse this spring. The Annual Fund Thank you to all who contributed to the VES Annual Fund in 2015-2016. Your gifts helped us achieve a record level of giving—more than 1,360 donors boosted giving over the $1.37 million mark in support of our students, faculty and programming. By investing in Virginia Episcopal School, you are providing essential unrestricted revenue that supports outstanding student programming, faculty professional development opportunities, scholarships for deserving students, and revitalization of our beautiful historic buildings and grounds. Your gifts ensure a bright future in the life of the school. Mrs. Holley Alexander Dr. William Alexander, Jr. ’71 and The Honorable Avarita Hanson Dr. and Mrs. Ray M. Antley, Jr. Mr. Frank B. Arbusto, Jr. Mr.† and Mrs. William J. Armfield IV Mr. and Mrs. Heyward T. Armstrong ’71 Mr. Jackie R. Atkinson, Sr. and Ms. Rebecca W. Atkinson Mr. and Mrs. Milton A. Barber III ’54 Mr. Milton W. Barnes ’85 Mr. and Mrs. Joseph L. Barrier, Jr. ’79 Mr. and Mrs. T. Warren Bass Dr. Emily Battle and Mr. H. Dill Battle ’84 Dr. and Mrs. Eric M. Baugher Mr. and Mrs. H. Preston Belcher ’78 Mr. and Mrs. David T. Bell ’87 Mrs. Rachel Bell ’92 and Mr. Edward Bell III ’93 Mr. and Mrs. James M. Best ’68 Ms. Martina B. Bill ’99 Mr. and Mrs. Bruce T. Blatzer Mr. James I. Blount ’87 and Dr. Anne Mauldin ’89 Mr. and Mrs. James A. S. Bonner ’70 Ms. Meg Booth Dr. and Mrs. Robert H. Bowden, Jr. EXPENSES Your dollars support students and faculty—72% of VES’ expenses. Set it and forget it with the Bishops Monthly Giving Program. VES is pleased to offer the Bishops Monthly Giving Program, which features both security and convenience for you, and provides the benefit of consistent Annual Fund support for the school. It’s easy to set up! Mr. Baker takes class outside. Video production of VES Book Night builds cross-disciplinary skills. Class of 1968 Mr. Harry L. Alverson III Mr. James M. Best Mr. W. Earle Betts III Mr. Eugene S. Bowers III Mr. Landon B. Lane, Jr. Mr. Charles L. Marler, Jr.
Class of 1969 Mr. William H. Bollin Mr. G. Walker Box Mr. James C. Cherry Mr. C. Lynch Christian III Dr. Ned M. Cleland Mr. H. Clay Ferebee IV Mr. Robert N. File Mr. Peter E.W. Floyd Dr. Lewis A. Foster Mr. Charles E. Green III Mr. Peter D. Grover Mr. R. Thomas Hairston, Jr. Mr. Frank A. Johnson Mr. George W. McCleary, Jr.
MARY HODGES GEORGE ’89 ALUMNI ASSOCIATION PRESIDENT Mike ’87 and I believe deeply in the exceptional work VES does in guiding students to achieve their full potential. We see faculty inspiring students, students leading the school’s culture, and lasting relationships forming and thriving on the Old 160 and beyond. Class of 1982 Mr. Lee S. Ainslie III Mr. Michael K. Alford Mr. Lynn K. Brugh IV Mr. Victor M. Dandridge III Mr. Samuel H. Duerson III Mr. Everett L. Gage III Mr. John T. Gibbs Mr. C. Frederick Miller Mr. Stewart M. Roddey Mr. Christopher B. Smith, Sr. Mr. G. Scott Taylor, Jr.
Class of 1981 35TH REUNION Mr. Horace P. Beasley Mr. Brian H. M. Bowen, Jr. Mr. Joseph B. Brewer III Mr. John H. Carrington Mr. Michael F. Croxson Mr. William H. Fralin, Jr. Mr. Paul Fulton III Mr. John H. High, Jr.
Class of 1987 Mr. Olugbenga P. Akinfe Mr. James S. Battle Mr. James I. Blount Mr. Peter F. Cronin Mr. Cameron M. Evans Mr. David C.F. Fant Mr. Michael R. George Dr. Timothy E. Harris Mr. Edwin E. Maddrey III Mr. Turner C. Moore Mr. Robert M. Workman, Jr.
Mr. Kyle C. Frazier Mrs. Pippin Clifton Hinton Mr. Christopher W. Hood Mr. J. William Johnston IV Mr. Ripon W. La Roche III Mr. M. Courtland Nexsen Mrs. Sarah Shaw Parker Mrs. Emily Vermilya Phillips Mrs. Mary Bruce Cartner Stallard Mr. Clifton K. Walden, Jr.
Ms. Townsend R. Brogan Mr. Landon C. Courville Ms. Taylor C. Gondi Ms. P. Christian Hicks Mr. H. Williams Huffines Mr. James B. Jenkins Ms. Elizabeth A. King Ms. Michelle Martin Ms. Caroline F. McCrary Mr. Matthew C. Meadows Mr. Bryant W. Meeks Mr. Romey G. Poore, Jr.
William King Society The William King Society recognizes alumni who have both reached their 5oth reunion anniversary and support VES with their gifts. Colonel William King, a founding benefactor of VES, served as a trustee from 1916 to 1942. He was a local businessman, who was active in St. Paul’s Episcopal Church and served on the Lynchburg City Council. Upon his death, in addition to establishing a trust, King made a direct bequest to VES with the expressed preference that it be used to construct a new building. The trustees agreed and used the gift for the construction of the William King Field House, which served as the school’s main indoor athletic structure from 1950 until 1996. In 1998, upon the death of his niece Nancy King Peck, the school received the corpus of King’s trust—a $275,000 gift. In keeping with King’s interest in bricks and mortar, the Board of Trustees designated one half of the gift to help support three new structures: the Zimmer Science & Activity Center, the Philip L. Van Every Athletic Center (phase one), and the Craighill Tennis Center. The other half of the gift created an endowment fund specifically designed to support faculty development. VES’ newest William King Society members from the Class of 1966—L - R: Malcolm Harris, Mike Sudduth, Chick Robinson, Hugh Morrison, Alex Floyd, Bob Kluttz, Sr.
KRISTIN DABNEY 2016 - 17 PARENTS COUNCIL CHAIR CAROLINE ’17 & ANNA KATE ’19 The VES faculty and staff are incredible mentors and role models. Whether teaching, coaching, having lunch, advising or simply sitting next to our daughters at an event and engaging with them, they demonstrate their love and commitment to guiding our daughters toward full stature. Their impact is profound and for that we will be forever grateful. on behalf of the VES Annual Fund. Former Parent Giving Mr. and Mrs. Lee S. Ainslie, Jr. Dr. and Mrs. William E. Albers Mr. and Mrs. John R. Alford Mrs. Helen Allen The Reverend Louise Anderson and Mr. Samuel Anderson Dr. and Mrs. Ray M. Antley, Jr. Mr. Frank B. Arbusto, Jr. Mr. and Mrs. Mark R. Armstrong Mr. and Mrs. G. Laurence Baggett ’62 Mr. and Mrs. Joseph L. Barrier, Jr. ’79 Mr. and Mrs. Uwe Barth Judge and Mrs. J. Martin Bass Mr. and Mrs. G. Thomas Battle, Sr. ’50 The Reverend Doctor Thomas W. Bauer Mr. and Mrs. C. Wood Beasley Mr. and Mrs. C. Wood Beasley III ’75 Dr. and Mrs. Bruce E. Bentley, Jr. Mr. and Mrs. W. Earle Betts III ’68 Mr. and Mrs. David B. Bice ’74 Mr. and Mrs. Selby A. Blair, Sr. ’79 Mr. and Mrs. Bruce T. Blatzer Mrs. Mary Morris G. Booth Dr. and Mrs. Robert H. Bowden, Jr.
Mr. and Mrs. Edward T. Cook, Jr. The Honorable and Mrs. John T. Cook ’75 Dr. and Mrs. William A. Cook III ’74 Mr. Nicholas G. Costas ’79 Mr. and Mrs. John W. Craddock, Jr. ’77 Mr. and Mrs. Daniel C. Craft Mr. and Mrs. Francis W. Crawley ’66 Mr. and Mrs. Gary M. Cuccio Mr. and Mrs. Stephen B. Culbertson Mrs. Constance Dahlberg Mr. and Mrs. A. Douglas Dalton, Jr. Mrs. Anne Harvey Davidson Mr. and Mrs. James L. Davidson, Jr. ’53 Mr. and Mrs. William S. Davidson ’59 Mr. James J. Dawson Mr. and Mrs. G. Alexander Dirom II ’53 Mr. and Mrs. John J. Donovan, Jr. Mr. and Mrs. James H. Doughton ’71 Ms. Craig P. Dozier Mr. John C. Dozier Mr. and Mrs. Charles F. Du Bose ’76 Mr. and Mrs. S.H. Duerson, Jr. Ms. Susan T. Duerson Mr. and Mrs. Kemp R. Dunaway, Jr.
Mr. Michael R. Ragsdale ’66 Mr. and Mrs. George P. Ramsey, Jr. Dr. and Mrs. Robert K. Ramsey Mr. and Mrs. William T. Ramsey ’75 Mr. and Mrs. B.B. Dawson Rascoe, Sr. ’77 Mrs. J. Peter Rascoe, Jr. Mr. and Mrs. Michael C. Reeves Mr. and Mrs. William A. Rice, Jr. Prof. and Mrs. Steven Riethmiller Mr. and Mrs. Stephen G. Roberts Dr. and Mrs. Michael S. Robertson Mr.† and Mrs. Frank C. Roddey Mr. and Mrs. Jeffrey C. Ross Mr. and Mrs. Bradford B. Sauer ’70 Dr. and Mrs. Charles J. Sawyer III Mr. and Mrs. Robert F. Scott Mrs. James V. Shircliff Dr. Timothy J. Silvester Mr. and Mrs. Robert H. Slater Mrs. Cathy Smith Mr. and Mrs. Douglas W. Smith Mr. and Mrs. George T. Smith, Jr. Dr. and Mrs. James A. Smith III Mr. and Mrs. Parks H. Snead III ’78 Secretary and Mrs. John W. Snow Mr. and Mrs. A. Donald Stallings Mr. and Mrs. Christopher A. Starr Mr. and Mrs. Thomas F. Stoughton, Sr. ’78 Mr. and Mrs. Keith Swan Mr. and Mrs. William J. Sydnor II Dr. and Mrs. Robert W. Sydnor Mr. and Mrs. Robert B. Taylor, Jr. ’75 Mr. and Mrs. Rodney E. Taylor ’78 Mr. and Mrs. John G. Thomas ’51 Mr. and Mrs. Alexander P. Thorpe IV Mr. and Mrs. John S. Tinsley, Sr. Mr. and Mrs. Charles A. Tulloh Dr. and Mrs. James L. Van Dyke Mr. and Mrs. Charles J. Van Horn Mr. and Mrs. Isaac C. VanMeter IV Dr. and Mrs. David A. Vaughan Ms. Mary Frances Vemer Dr. and Mrs. Robert B. Vogel Mr. and Mrs. C. Keith Walden, Sr. Mr. and Mrs. George C. Walker, Jr. Mr. Thomas N. Waller ’49 Mr. Peizhou Wang and Mrs. Xuemei Tong Mr. and Mrs. Peter O. Ward, Jr. ’57 Mr. and Mrs. Woodrow J. Warren ’73 Mr. and Mrs. Charles C. Watson, Jr. Mr. and Mrs. T. Ashby Watts III ’53 Mr. F. Beale Wilhoit Mr. and Mrs. Alfred Williams IV ’68 Mr. and Mrs. Joseph S. Williams Mrs. John C. Williams Mr. and Mrs. Carlton F. Williamson Mr. and Mrs. Scott D. Winston Mr. and Mrs. John M. Woltz, Jr. Dr. Patrick P.L. Wong and Mrs. Ng Wong Mr. and Mrs. Raye P. Woodin III ’64 Mr. and Mrs. John H. Woolard, Jr. ’76 Dr. and Mrs. Richard R. Zechini Mr. and Mrs. John G. Zehmer, Jr.
Master and Margaret T. Bourne Chair of Science, tackle a chemistry challenge. LARISSA & JASON KNEBEL FACULTY So many students have left an indelible mark on us and on our children. Kind, clever and often giddy, students here continue to reinforce the idea that our school is a wondrous thing, worth dedicating one’s life to. Each of our students is irreplaceable in the joys of memory. Faculty and Staff Giving Our faculty and staff know the importance of every gift to the VES Annual Fund. They value the impact their contributions will have on the lives of our students. For these reasons, 100% of the VES faculty made a contribution to the Annual Fund. We are extremely grateful for this statement of their commitment to the school. This page: Meg Walsh ’18 and Paul Skorcz ’18 | Right page: Zoe Hazan ’17 and Hadley Meadows ’18 collaborate on an episode of Bishop Radio. HONORING & REMEMBERING Left Page: Mrs. Csatlos and seniors Abby Martin, Ghaven Williams, Caroline Taylor and Joseph Hwang talk about college plans. | This page: Vicky Li ’18 and Tariq Fuller ’19 work on the Pokebots championship-winning robot. McCormick Dorm Challenge Can we reach $1,500,000? It’s not too late to make your contribution to the Bruce E. McCormick Dormitory. the new dorm in his memory and with the hope the VES community would contribute another $500,000. Make your gift today at www.ves.org/mygift! As of September 30, 2016, VES has responded to this challenge, bringing the total to $1,400,000. The Langhorne Chapel Society is composed of donors who have made planned gifts to the school, including bequests, gift annuities and life insurance designations. These gifts may be designated for specific purposes, such as scholarships, program endowments, and faculty development, or may be left undesignated to help address future needs. VES is pleased to honor today those donors who provide for the VES of tomorrow. Mr. and Mrs. James A. Hight, Sr.† Mr. James A. Hight, Jr.† Mr. R. Archer Hobson, Jr. ’36† Mr. and Mrs. Ronald E. Hood, Jr. ’74 Mr. and Mrs. J. Lloyd Horton ’58 Mr. and Mrs. David R. Howard ’76 Mr. Carroll W. Hoyle ’71 Mr. and Mrs. Christian S. Hutter III ’61 Mr. and Mrs. Nelson S. Irey II Mr. and Mrs. Ira J. Jackson III Mr. and Mrs. S. Clark Jenkins, Jr. ’97 Mr. and Mrs. Samuel Clark Jenkins Mr. and Mrs. Earl Johnson, Jr. ’50 Dr. A. Owens Jones, Jr. Mr. and Mrs. Albert S. Kemper III ’47 Mr. and Mrs. Franklin W. Keplinger Dr. and Mrs. Christopher L. King Mr. and Mrs. Meade B. King Mr. and Mrs. Robert H. Kluttz, Sr. ’66 Mr. H. Arthur Lamar ’29† Ms. Susan S. Landis Mr. and Mrs. Landon B. Lane, Jr. ’68 Mr.† and Mrs. Harry F. Langhorne ’34 Mr. and Mrs.† Brinton LeCompte Mr. and Mrs. Parker H. Lee III ’67 Mr. and Mrs. Reid G. Leggett ’74 Mr. Henry W. Lewis ’33† Mr. Herbert I. Lewis ’27 Mr. and Mrs. C. Addison Lineberry ’92 Mr. and Mrs. Willie J. Long, Jr. ’40† Mr. and Mrs. J. Ellison Loth ’22† Mr. Frank S. Loyd ’32† Mr. and Mrs. Richard M. Lynn ’60 Mr. Thomas H. Maddux III ’47 Dr. Robert A. Magill, Jr. ’43† Mr. Charles E.A. Marshall ’24† Dr. and Mrs.† William M. Massie, Sr. Mr. R. Lee Mastin† ’57 Mr.† and Mrs. Robert R. Mauldin Mr. S. Lee Maulsby ’39† Mr. Bruce E. McCormick† The Honorable and Mrs. Charles L. McCormick III ’54 Mr. A. Weems McFadden ’43† Mr. and Mrs. Wallace G. McKenna, Jr. ’67 Mr. and Mrs.† James B. Mead ’43 Mr.† and Mrs. R. Maxwell Meador Mr. Wiley Merryman† Mr. Ernest J. Monroe ’21† Mr. Wilber H. Morrill† Mr. and Mrs. Frank W. Morrison Mrs. Helen H. Morrison Mr. and Mrs. Hugh H. Morrison, Sr. ’66 Mr. and Mrs. John H. Morrison, Sr. Need a Unique Holiday Gift? Our book makes a wonderful present for VES friends and family!